Norsk Data was a computer manufacturer located in Oslo, Norway. Existing from 1967 to 1992, it had its most active period in the years from the early 1970s to the late 1980s. At the company's peak in 1987, it was the second largest company in Norway, and employed over 4,500 people. Throughout its history Norsk Data produced a long string of extremely innovative systems, with a disproportionately large number of world firsts. Some examples of this are the NORD-1, the first minicomputer to have memory paging as a standard option, and the first machine to have floating-point instructions standard, the NORD-5, the world's first 32-bit minicomputer. 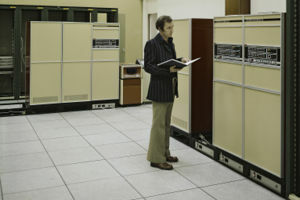 Norsk Data computers in the Main Control for the CERN Super Proton Synchrotron November 1974. The origins of Norsk Data go back to the development of digital computers at the Norwegian Defense Research Establishment at Kjeller, Norway, where several early computers had been designed, such as the SAM and the SAM 2, also known as the FLINK. The success of this program resulted in the founding of A/S Nordata - Norsk Data Elektronikk on August 8, 1967 by Lars Monrad Krohn, Per Bjørge and Rolf Skår. The company became a significant supplier of minicomputers to many research projects, in particular to CERN in Geneva, Switzerland, where they were chosen to produce the computers for many projects, starting with their Nuclear Accelerator Project, Norsk Data's international breakthrough contract. The other market segments Norsk Data succeeded in were process control, Norwegian municipal administration data centers, newspapers, as well as parts of the educational, health, and university sector. For a period in 1987, Norsk Data was the second largest company by stock value in Norway, second only to Norsk Hydro, and employed over 4,500 people. In March of 1991, shortly after the Soviet Union attacks on the newly independent Lithuanian Republic, Norsk Data donated the first computer to Lithuanian Institute of Mathematics and Informatics. This donation started the development of LITNET - Academic and Research Network in Lithuania. Later that year, the network connection lines, directly connecting Vilnius to Moscow, were shut down. With the help of the hardware, again donated by Norsk Data, Lithuania was able to use it's first satellite-based internet connection, which operated at 9,6 kbit/s. This was the first Lithuanian communications line, which was totally independent from former Soviet Union. After a long period of exceptional success, the Norsk Data "empire" collapsed in the early 1990s, mostly due to not realizing the impact of the PC revolution (as well as the growing competition from UNIX-based workstations). Norsk Data technology was continued by Dolphin Interconnect Solutions. Norsk Data was purchased by Telenor and went through several rebrands and relaunches. Although the Norsk Data breakup caused a large number of layoffs, a large number of employees and intellectual property lived on in various smaller companies. Some went bankrupt quite quickly, some were bought for tax purposes. The quality of management also varied widely. The Hardware Research and Development group was split off into Dolphin Server Technology in 1989. Dolphin later split off into a number of companies, by far the most successful of these being Dolphin Interconnect Solutions, a cluster interconnect hardware company. In the UK Telenor kept the Norsk Data name for several years, focusing in on Hardware support and maintenance contracts, mainly with HMCG and local governments. At the tail end of the dot com boom Telenor decided to try and expand the service by acquiring the ISP CIX and a hosting company in Manchester, XTML. The name and business focus of this group of companies was changed several times in the early 21st Century, being known as Nextra (along with the acquired CIX & XTML), Telenor Business Solutions (still with CIX & XTML) and finally reverting to ND Norsk Data once CIX & XTML had been resold to Pipex, reportedly for less than 10% of the purchase price. Much of the loss in value of the acquired companies was put down to the astronomical "goodwill" payment included in the purchase price during the "dotcom boom" and the poor interim management of the group. NORD-100, 16-bit, from 1978, later renamed ND-100. First single-board 16-bit minicomputer CPU. ND-5900-2, ND-5900-3, and ND-5900-4, dual-, triple- and quad-CPU 5000 series machines. PLANC compiler - PLANC was the system language of Norsk Data - a language "defined by its implementation"
Lisp Machine Lisp – MIT Lisp machine lisp developed in a joint venture Racal-Norsk. Technovision - CAD system developed in Mülheim an der Ruhr, Germany. Technovision was a modular CAD/CAM system which was internationally considered to be one of the best on the market. It was in part designed by Norsk Data Dietz GmbH. A special workstation named the Technostation was designed specifically for running Technovision. It was extremely well received by international press, and even won a design award. Along with the above listed applications two batch languages were included, called JEC and XCOM. JEC was used primarily as a simple batch job controller, whereas XCOM was used for much more involved routines such as operating system patches etc. Most of the application came in two different editions, one compiled for Nord-100-series and one compiled for Nord-1100 series. When ND discontinued NOTIS development in 1989, it was continued by NOTIS AS, which later changed its name to Maxware. A point of note: the World Wide Web originated when Tim Berners-Lee wrote the Enquire program in Pascal on a Norsk Data NORD-10 running under SINTRAN III at CERN. This article was originally a copy of the English Wikipedia article Norsk Data in 17th Oct 2008. This page was last modified on 5 October 2017, at 11:05.